Can trash really be a design gold mine? 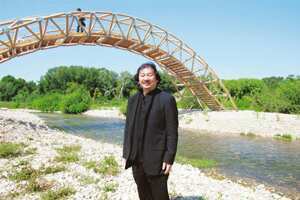 Cardboard crossing: Shigeru Ban stands in front of a ‘paper bridge’ designed by him near the Pont du Gard, France, in 2007. Discarded paper reconstituted into cardboard and wood scraps at demolition sites have not been choice materials for proper furniture, let alone buildings. In 1972, when architect Frank Gehry designed his Wiggle corrugated cardboard chair, it was considered revolutionary and perhaps even eccentric, although he often used similar materials to make building models. Now, two superb books highlight different uses for recycled materials: Skinny, foot-wide cardboard tubes can be strong enough to form inhabitable buildings; garbage bins full of wood scraps and other building detritus can be a green-minded furniture designer's gold mine. In Shigeru Ban: Paper in Architecture with essays by Riichi Miyake (Rizzoli), Shigeru Ban, the visionary Japanese architect, who has made a career of exploring humble materials to form expedient shelters after natural disasters, also toys with furniture, geodesic domes and other canopies made of narrow cardboard tubes. In this book, Ban also showcases his weekend home, his first structurally sound permanent house, which he designed in 1995. It is made of sinewy S-curved walls of tall, vertically arranged tubes of 5/8-inch-thick cardboard. The 8-foot-tall walls, capped by a flat roof held aloft by cardboard columns at each corner, are waterproofed with paraffin wax and resinous glue. Remake it Home: The Essential Guide to Resourceful Living by Henrietta Thompson (Universe), is a repository of DIY ideas and a catalogue of design firsts by the likes of Jasper Morrison and Marcel Wanders that stand, as Thompson describes in her introduction, “at the intersection of design and necessity". Clever recycled-wood furniture in the Storage chapter include pieces made of packing crates, as well as Dutch designer Piet Hein Eek’s 1990s Scrapwood Cupboards, which are also featured prominently in Broken Embraces, Pedro Almodóvar’s just-released film. Eek, looking for affordable raw materials, found painted boards with chipped or peeling paint in garbage bins and used them as drawer fronts and cupboard doors. The boards randomly patched together in serendipitous patterns give Eek’s now much sought-after furniture a distinctive one-of-a-kind look and a new life to waste wood. Expert opinion: “Although remaking, recycling and reusing waste is often portrayed as a new trend in contemporary design, ‘appropriation’ is, in fact, a lasting aesthetic movement that spans at least half a century," writes author Thompson. Artists appropriated waste for making art first and the idea of reusing such material then “infiltrated the world of architecture", she says. Now, in keeping with modern-day practices of recycling and reusing, many witty household objects are also made of this ubiquitous “new material". Pros: As long as things are manufactured and dwellings are being built, there will be waste materials and discarded objects to reuse. In that sense, waste is a renewable resource. Cons: Societies that produce excessive packaging and other waste, particularly in the West, generate most of this “new" material.